Lunch is optional and costs $10 for members who RSVP before April 23th. South of Guelph, just north of 401, exit 299. Calling all organic players in Ontario! Global sales are now worth more than $67B at a growth rate of 27% between 2008 and 2012 – Canada is the 4th largest organic market, and Ontario generates $1B in organic business alone. And yet our sector struggles to fund our representation, policy makers seem reluctant to name the organic opportunity specifically, and poor cultural knowledge of our agronomics and our markets within government and ag sector organizations means Ontario farm families and businesses are missing out on opportunities. Our work as a Council is crucial to ensuring Ontario gets and maintains its share of this growing market. Come learn what OCO has been doing on your behalf, and help set our goals in 2014-2015. OCO has a winning communications strategy to introduce at the AGM, as well as a $2 at the Till Campaign for retailers, processors and distributors of all scales and sizes to support industry-only funding. OCO has a lot to say on your behalf- come learn about sustainable funding for OCO and what role your business can play in helping us achieve it. A number of our members have met the challenges facing those who’ve pioneered markets only to meet with challenges of access. Our panel will discuss the concept of “an organic glass ceiling” and strategies for dealing with the reality that our sector continues to try to fit its round peg in a square hole market. FEATURING: Don Rees, Organic Meadow; Randy Whitteker, ONFC; Jennifer Pfenning, Pfennings Organics; and Tom Manley, Homestead Organics. Representation for the organic sector requires OCO to re-think our strategy as an organization. This winter, your Board re-imagined OCO’s function as a “communications” enterprise. The Council’s future rests on its ability to serve the long term advocacy function the group was created to serve and provide meaningful value to our membership in exchange for financial support for our activities. 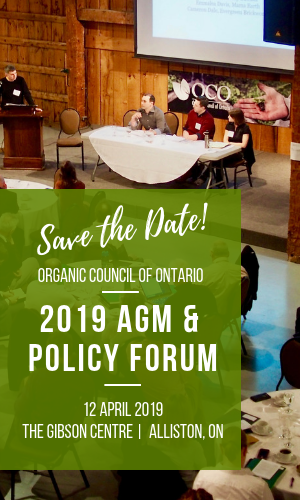 Historically, we have undertaken social and economic development projects that forward the agenda of our collective Ontario Organic Strategic Plan and meet the goals of funding agencies at the federal and provincial governments. As our sector moves past the 3% of the mass market target over the next few years, we are experiencing backlash, “me too” branding of various “sustainability” claims, and consolidation. The time for advocacy unhindered by ties to specific governments is ripe. The Board has been working hard over the past 2 years to steer our Council away from reliance on project funding and toward financial self-sufficiency from within our sector, including the consumer. Our priorities remain solving the intra-provincial trade loophole, ensuring organic farmers are treated fairly within the existing frameworks like supply management, and advocating for structural changes where those barriers are insurmountable with “pioneering spirit and drive” alone. Not for Profit Legislation has been tabled in Ontario that will likely take effect in June 2014, with the most glaring change a drastic increase in the percentage of members who need to vote at AGMs to make results valid. Our membership and fundraising need to support the core activities of the organization if we are going to advocate in the way our members expect of us. The Board has spent two years re-thinking the OCO model and how we can get the best return on membership investment and ensure we have the budgets we need to properly represent the sector. There will be some changes OCO needs to make to our By-Laws, including allowances for electronic voting at AGMs and other general meetings of the membership. We are further investigating the representation model, where subsectors elect their representative. Subsectors would vote and bring that vote to the floor for support of the entire membership as a new procedure. Each year we renew half of our Board of Directors on a 2 year term based on their value chain affiliation and membership. Please make your nominations known to the AGM Planning Committee www.organiccouncil.ca/AGM or send the attached Nomination Form to the OCO office. Nominations will be taken at the AGM. Caucus Sessions: what’s important in your sector? CANADA ORGANIC STANDARDS REVIEW: Until the end of March, OFC is encouraging our participation in the standards review. OCO can forward submissions from the sector or send comments directly.